The Embassy of Italy in Sweden invites you to the Italian Design Day 2019 on March 20, at Openlab (KTH) in Stockholm. Come and meet our exhibitors and international speakers. Visit the open exhibition between 15.00-17.00 while enjoying a cup of coffee. The evening event will start at 17.00 (registration required, see info below), with mingle and Italian buffet! – “Critical Utopias. 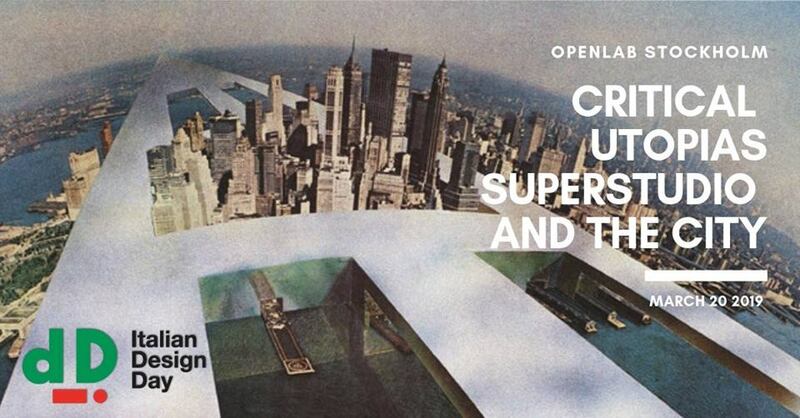 Superstudio and the City: From The Continuous Monument to Supersurface”. A round table discussion with the Italian Ambassador of Design 2019 in Sweden 𝗚𝗮𝗯𝗿𝗶𝗲𝗹𝗲 𝗠𝗮𝘀𝘁𝗿𝗶𝗴𝗹𝗶, Associate Professor of Theory and Architectural Design at University of Camerino, 𝗣𝗲𝘁𝗲𝗿 𝗟𝗮𝗻𝗴, Professor in Architectural Theory and History at the Royal Institute of Art and 𝗘𝗹𝗶𝘀𝗮𝗯𝗲𝘁𝘁𝗮 𝗧𝗿𝗶𝗻𝗰𝗵𝗲𝗿𝗶𝗻𝗶, Poltronova Historical archive.